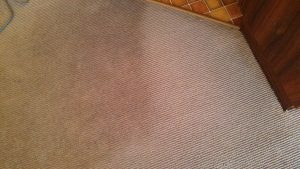 You don’t have to leave windows open all day waiting for the carpets to dry and you won’t have those ‘recurring” stains that appear with some other methods. This dry method won’t stretch your carpet, it’s much softer on the pile. We start with a thorough deep extraction of the build up dirt that’s accumulated in your carpet, a normal household vacuum won’t pick this up. This is THE SECRET to low moisture cleaning… Because if you leave this debris in the carpet and then wet the carpet it turns to mud! The great part is your carpet will improve with every subsequent vacuum as the Encapsulation Crystals capture the dirt. Check out these impressive BEFORE & AFTER shots of a rental carpet that we cleaned. We start with a thorough extraction, removing the dirt from your carpet FIRST is Essential! and that’s because 80% of the dirt and dust particles are removed with the right Vacuum System. Pre-spray and treat stains. Normal surface stains usually disappear in minutes with our “super strength” spotter treatment, however there could be an extra cost for time spent treating very deep or stubborn stains that could need dwell time in between treatments. We then bring in our Super Powerful Orbital cleaner, it is more gentle on the carpets than the original rotary cleaners. The Orbital system that we use has many different contact points as it gently rotates on the carpet. It drives the Encapsulation solution deep into the pile and drags out any dirty marks which are then transferred to the pad. We use excellent quality pads and this gives us Awesome results. To finish off, we use a carpet rake to set the pile and the job is done! Your carpet will smell beautiful with just a hint of mint – The reason we get better results is because we pay for better quality, Non-Toxic Products that are better for you and your families’ health. If we can’t get it out then you can be sure no one else can either! Some stains may have permanently stained the fibre of your carpet and if you have used other chemicals to try and remove it yourself, you may have set the stain!